By 2024, Vladimir Putin would have been in power for 24 years, coming close to Josef Stalin who ruled the then USSR for 31 years. 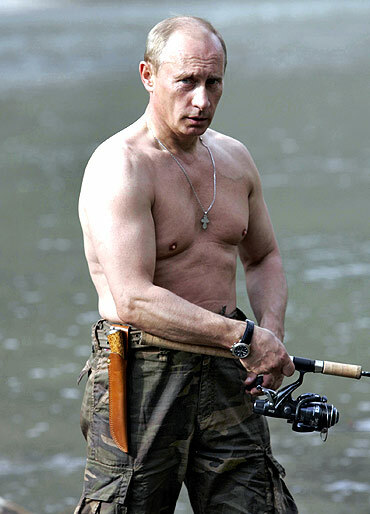 Vladimir Putin is a judoka, a former spy, a lover of outdoor adventure, someone who loves showing off his muscles -- and has an insatiable lust for power. Last week, after months of will he?-won't he?, Putin pushed his protege Dmitry Medvedev, now Russia's president, out of the way and announced he would run for the Russian presidency again, in 2012. Putin, his country's president from 2000 to 2008, is almost certain of election next year given his control over Russia's political system. After being in power for 11 years -- the last three as prime minister -- Putin remains Russia's most powerful leader since the formation of the Russian Federation after the fall of the Soviet Union in 1991. An amendment in the Russian constitution now permits two six-year presidential terms; making way for Putin to stay in power for another 12 years. By 2024, he would have been in power for 24 years -- coming close to the dreaded Soviet tyrant and mass-murderer Josef Stalin who ruled the then USSR for 31 years. Putin will be 72 when he presumably retires; Stalin was 75 when he died in March 1953. Dmitry Medvedev is expected to switch roles next year and re-serve as prime minister -- an office he held during Putin's earlier stint as president. Since the Russian constitution then prevented three terms as president, Putin stepped aside in 2008 and allowed Medvedev to take charge. It was always felt he would reclaim the presidency after the constitution was amended, but Medvedev did not go quietly, raising the spectre of an unlikely rebellion. If Medvedev, who is now a boyish 46, stays in unlikely favour with his mentor during Putin's likely double terms as president, he could still be president in 2024 (he will just be 59). 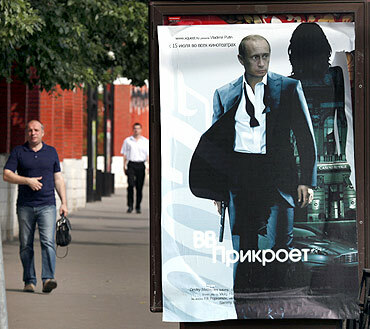 Medvedev tried unsuccessfully to shake off the legacy of the Putin era -- Russia is one of the world's most corrupt and dangerous nations -- but Putin and his allies remained in firm control at the Kremlin. The presidential election is scheduled for March 4, 2012, a day before the 59th anniversary of Stalin's death. 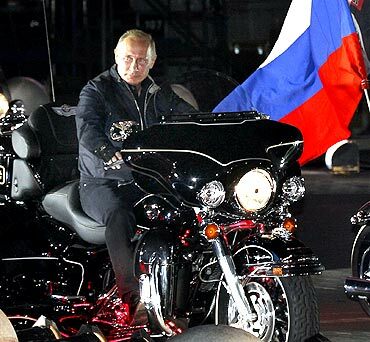 Image: Vladimir Putin during his visit to a bike festival. During Putin's two-term presidency, political opposition was often brutally wiped out and democracy was stage managed in Russia. Putin built his popularity on the back of strong economic growth (thanks to oil and gas revenues), but growth has suffered since and Russian markets fell to their lowest in two years last week. Yet Putin remains popular with the Russian public, often making an impression with unconventional macho appearances -- riding a Harley Davidson bike at a bikers's meet, diving to the bottom of Lake Baikal, posing with a polar bear and skiing down a volcano. The King will return to the Kremlin next spring, perhaps with a majority better than the 71% he was elected with in his last term as president. But surveying the revolutions in the Arab world that have overthrown firmly entrenched despots, uneasy will lie his crown.